The first known Jewish inhabitant of Brighton was Israel Samuels who was recorded as a resident in 1766/7. The community was established with the arrival in 1782 of Emanuel Hyam Cohen, a Rhienlander who married a local woman Hannah Benjamin and with her raised ten children. Brighton’s first Jewish house of worship was a rather humble meeting place in Jew Street (c.1792). The word synagogue means a ‘meeting place’ indicating its dual function as a House of Prayer, and a social and educational centre for the community. The upper part of the gabled front has a wheel window with the Tablets of the Law above. 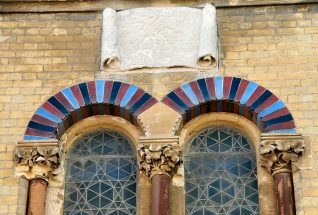 Ground- and first-floor windows round-arched and flanked by engaged sandstone columns with foliage capitals, the heads formed of glazed voussoir bricks in blue, red and black. 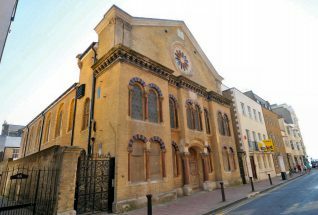 The Middle Street site was bought in 1874 and the new synagogue consecrated in 1875. The project had been put out to tender, with the work going to Thomas Lainson, surveyor of Hove’s Wick Estate. 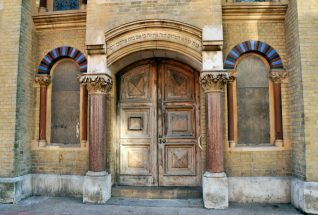 Lainson was not Jewish – but this was not unusual as many High Victorian, and even earlier, synagogue builders were Gentiles. 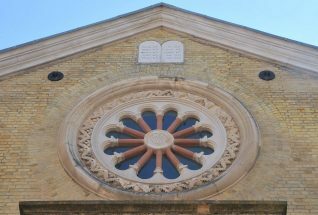 Although Middle Street preserves many design features found in synagogues since antiquity, its basilican shape gives it an Italian Romanesque quality – an example of the Victorian affinity with the past. What is going to happen to this lovely old building, surely it’s not going to be demolished? I lived at 60 Middle Street and I can remember my father, who was a double bass player in the pit orchestra at the Hippodrome just a few doors away, playing chess with the rabbi of the synagogue. This was after the war in about 1948’ish.